Mr. Lindh has practiced law in San Francisco, California since 1974. He resigned his partnership in Dorr Cooper & Hays in 1984 to form the partnership of Walsh Donovan & Lindh where he remained until August, 1999, when he joined Gibson & Robb. He became a name partner at Gibson Robb & Lindh in January, 2001. 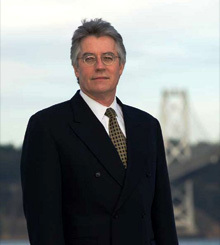 He specializes in maritime and aviation matters, product liability defense and insurance coverage disputes. He defends insureds for both domestic and foreign marine insurers in a variety of areas, including personal injury and wrongful death claims under general maritime law, Jones Act and 905(b) actions, and marina liability, repairers liability and construction defect claims. Mr. Lindh has substantial experience in product liability matters and represents a variety of power tool, household product and construction product manufacturers in litigation throughout California with experience in personal injury, construction and fire property loss claims. Mr. Lindh is a certified mediator, and is currently engaged by San Francisco Superior Court as a mediator for self represented litigants. Mr. Lindh was named as one of Northern California’s Super Lawyers by Super Lawyer Magazine. This honor is awarded to those lawyers whoa re among the top five percent of Northern California attorneys based on input by their peers and review by a Blue Ribbon Panel. Maritime Personal Injury Defense (San Francisco 1999), contributor. Pacific Coast Forum (California Oil Spill Requirements Expand to non-tank Vessels), April, 2000. Mr. Lindh has served as a guest lecturer for the California Maritime Academy’s Continuing Education Program and the Board of Marine Underwriters of San Francisco. Mr. Lindh presented The Aftermath of Maritime Disasters: the Exxon Valdez Perspective to the International Conference on Maritime Crisis Management in Kuala Lumpur and Singapore, September 1994 and subsequently to the Marine Underwriters of Southern California, Los Angeles, 1995, San Francisco Marine Underwriters, San Francisco, 1996, and Johnson & Higgins of California, San Francisco, 1996. He presented OPA 90: An Update in San Francisco, July 1998 and Long Beach, April 1999.